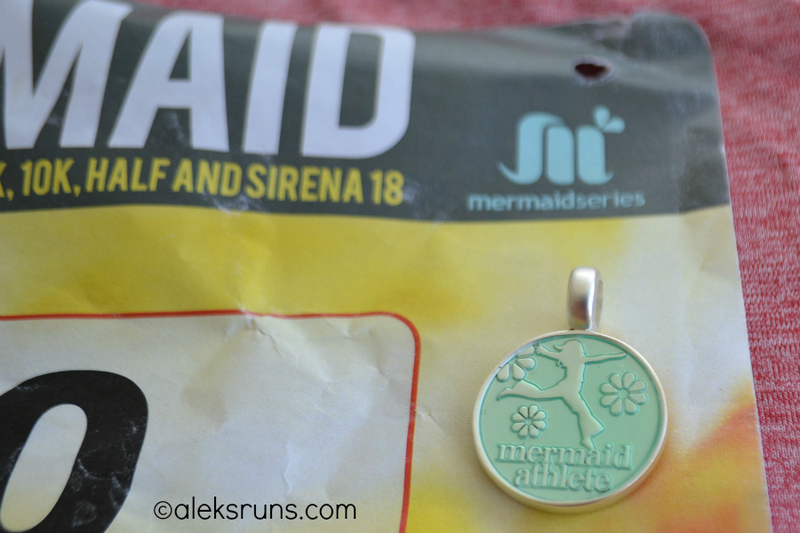 A few months ago, I was looking into women-only races that hand out pendants and necklaces to finishers — you know, actual bling rather than “race bling” — and discovered the Mermaid Series. 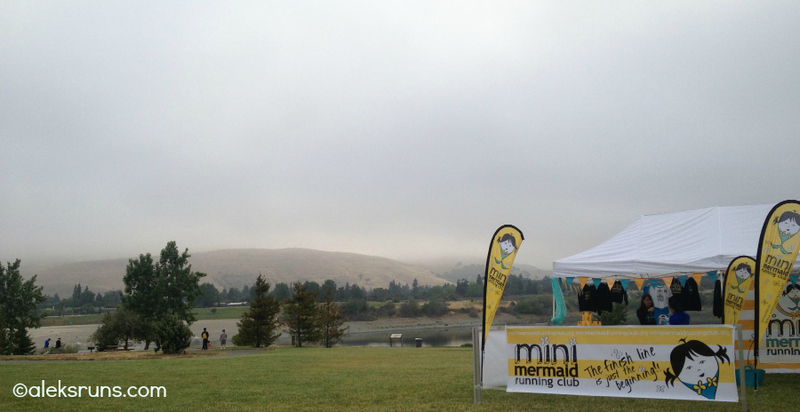 They put up a series of events in the Bay Area, including an 18-mile run, dubbed Sirena18, in the beautiful Quarry Lakes Regional Recreation Area; on Mother’s day weekend. It was a no brainer! But this time, the line to get in was pretty much non-existent and I parked with one hour to spare. The area is beautiful, but at 6:30 in the morning it was a bit too chilly for hanging out: So like most people, I visited the porta-potty and then dashed back to the car for some warmth. 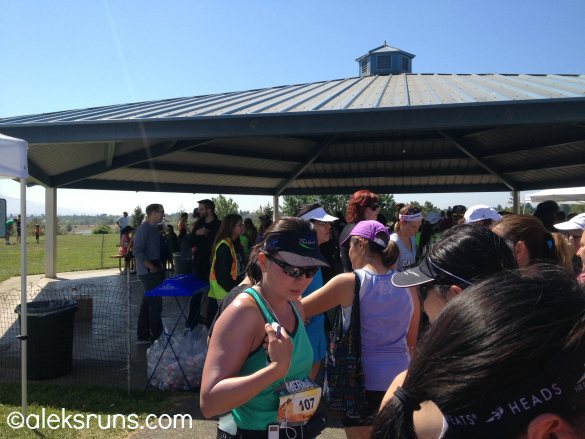 There were only 125 women running the 18-miler and the start area was very relaxed. 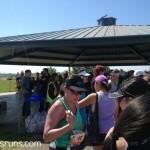 I chatted with some MRTT friends (running the half, 10K or 5K) until five seconds before the gun — and we were off! 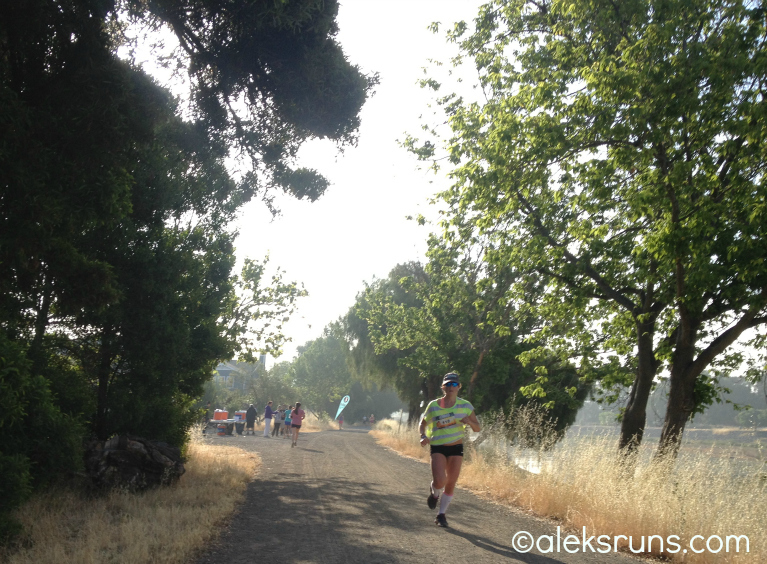 The first couple of miles looped around the lakes: I had no time goal for this race — other than to have a good time! 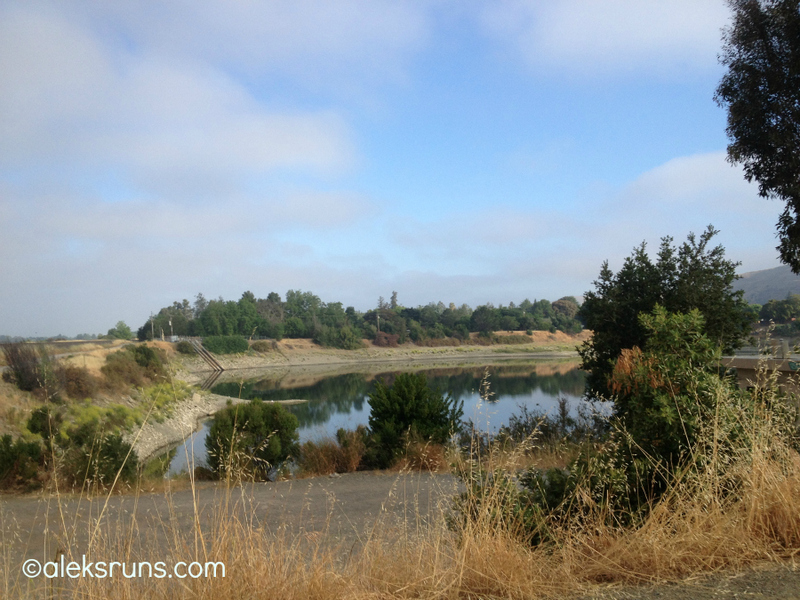 My pace felt like a 10-min mile, super easy and relaxed; I was surprised to see my Runkeeper time at 8:57 at the first mile marker. Speaking of Runkeeper, it decided today was not its day to keep track of things: Good thing I didn’t have to watch my pace for this one! 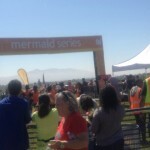 In fact, one thing this Mermaid Run was in need of was more mile markers – especially for the Sirena18. 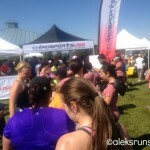 After mile four, they basically left us to wonder how far we’d gone (26 miles, according to my RunKeeper… Now 35! Now 43!) — and how fast. And when available, mile markers were for some reason facing the wrong way? Eh, I’ll let that slide. 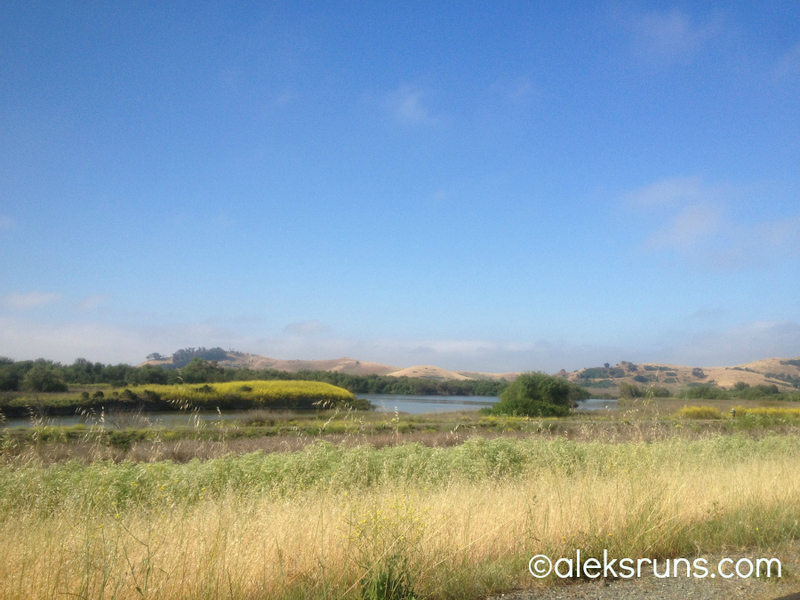 It was a beautiful day and I was running: If you’re thinking this looks like any ol’ training run (where are the other racers? ), you’d be correct. 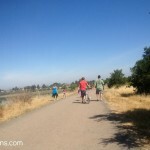 With so few of us over an 18-mile distance, we spread out quickly and I was running in a small groups of 2-3 women of by myself most of the time. 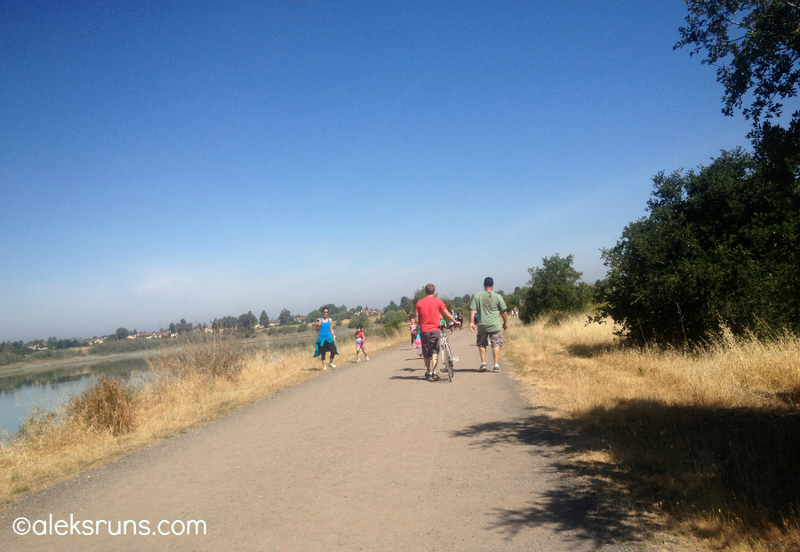 The trail was open to all others, of course, so there were lots of cyclists, walkers and non-race runners, too. 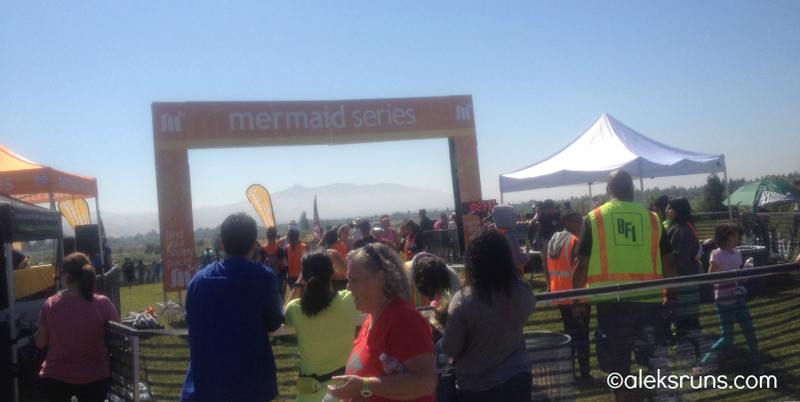 The best part was the final mile, when we ran into the Mini Mermaids, who were running their 1.5 mile kids run, all dressed up in Mermaid costumes. Too cute! 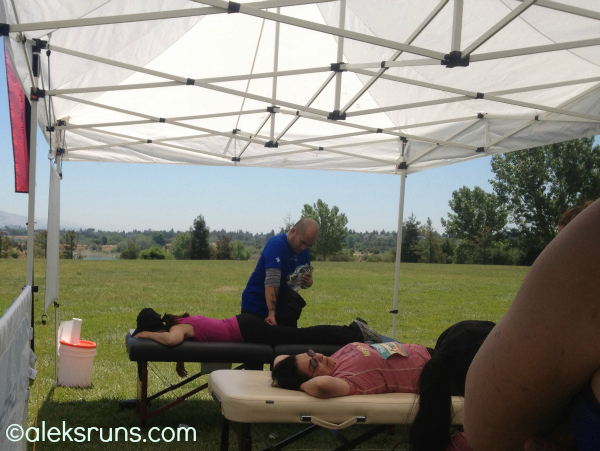 Behind the Finish line: Now that the 18 miles were behind me, the real difficult part began! Getting some food, drink and a massage. That is: waiting in lines. Long, long, long lines! Chiropractor/ massage line: I gave up on that one after a while because I figured getting food and drink was more important. I must’ve waited for at least a half hour on that one before giving up, too. Seriously. Running 18 miles: no problem. Waiting in line? I give up! I ended up not eating anything, but drank a few more bottles of water, checked out my results – 9th in my age group… out of 20; well – better than half! 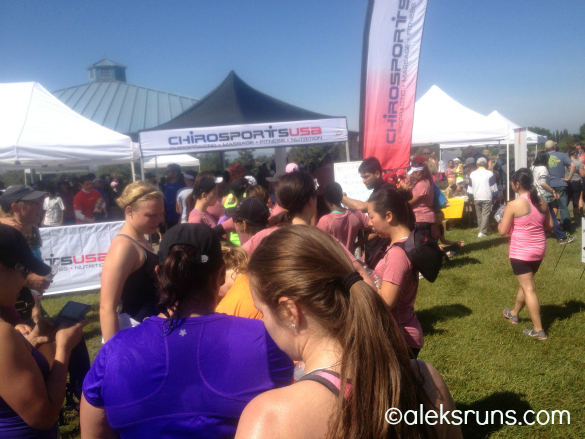 – and came back to the massage line, determined to wait it out this time. To survive! To persevere! The line seemed a lot shorter than it was earlier, but let me tell you: I spent at least an hour there, if not longer. But the view was awesome: Finally, my turn. Yes, please! Now, the important stuff: the bling. I have to say that when the volunteer handed me a little baggie with a pendant inside – no chain – I was a bit disappointed. But on further inspection, the pendant is not bad: I may even wear it some time! The t-shirt rocks: It looks just like a regular t-shirt, with no race distances or sponsor logos in the back, which I love. 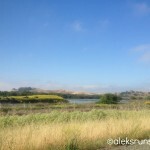 It means I can – and will! 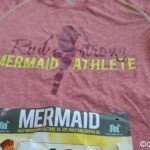 – wear it a lot, rather than just stash it in the pile of race shirts to be forgotten until who knows when. Do you ever wear race t-shirts other than to run? Congratulations! 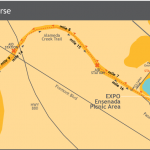 18 miles is quite an event! I love the Mermaid events. 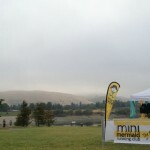 I did that 5k at Quarry Lakes a couple of years ago and I’m doing the Mermaid Tri next month. Such a supportive group. Thanks, and have a fun tri! I wanted to do that one too, but it’s on the same weekend as the See Jane Run half, which I’m running and I figured it may be too much to do two events in two days! 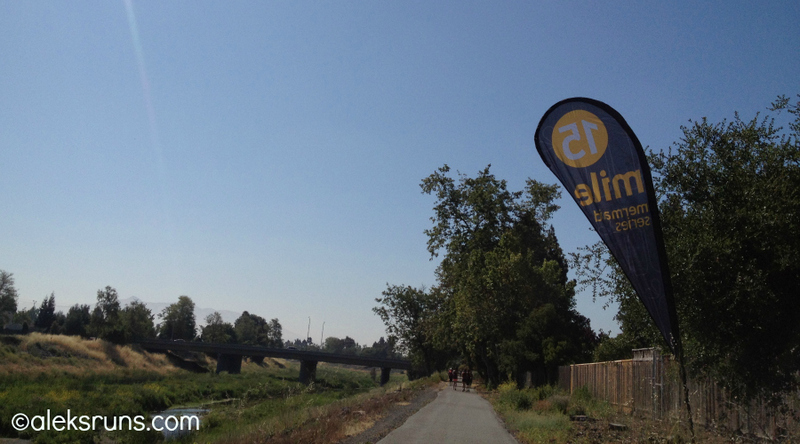 (Though I plan to do the SJR Tri in October, followed by RNR SJ half the next day – we’ll see ;)) Good luck! Heh….That sounds kind of like the half I ran in Napa a few weeks ago. 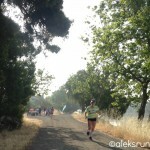 Almost no mile markers, some facing the wrong way…Good thing I didn’t really care. Also that is some, um, impressive satellite dysfunction. Looks like a pretty race, though! Glad it was a fun time! 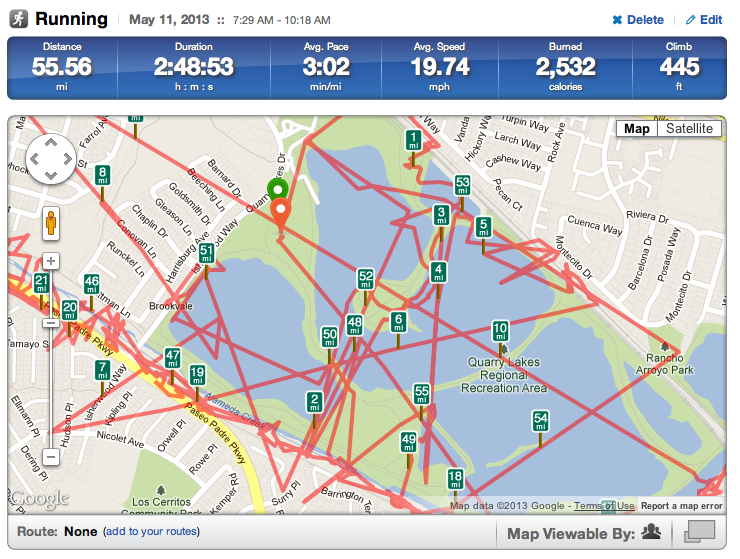 LOL I don’t know what’s wrong with my phone, but the next day (Sunday), it tracked my bike ride perfectly!! 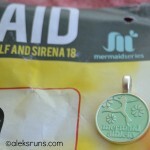 I was there and ran the Sirena 18 also. I saw you at the beginning and wanted to tell you that I loved your blog, but didn’t get a chance. Then I saw you right after the finish waiting in line and thought I will have to go back and tell her and went to stretch and talk to my family and then totally spaced it. I agree about the mile markers, it was strange. 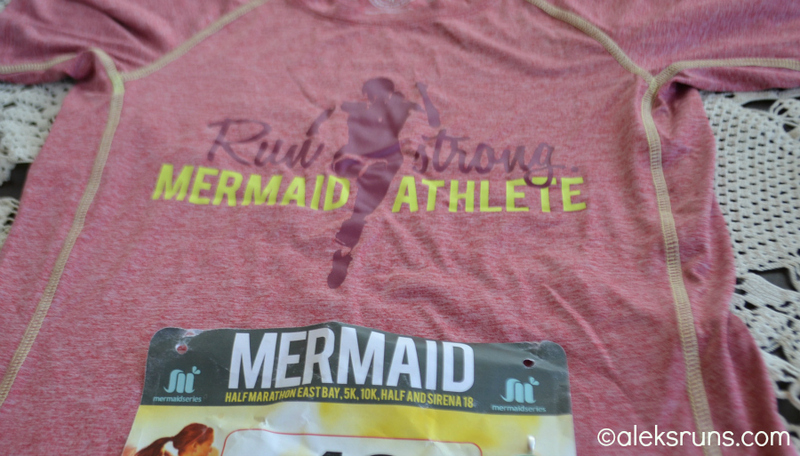 I also agree that the mini – mermaids gave me just the boost I needed for the final mile. Great job! Congrats on a great run. 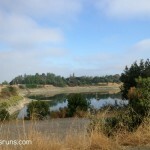 That looks amazing and very peaceful place to do a race…good for the soul too! 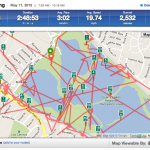 I really hope that I am NOT the only one that looks at your RunKeeper map and thinks, “Go home RunKeeper, your drunk”? PLEASE TELL ME I AM NOT? Sorry, that’s “you are”…I have been up late baking so I have some of tomorrow off! LOL, I don’t know what’s wrong with my phone 🙂 I think it’s been dropped way too many times!